Random Anny .Com: I'll buy Mums but I won't admit summer is ending! I'll buy Mums but I won't admit summer is ending! Its a good thing I didn't have carseats today because I came home with two of these strapped into my back seat! I picked up two of these "oopsy" mums for $1 each at Lowes. Both were lopsided and looked pretty quirky in a container but look fine planted. I have to keep up with the daily waterings until they're established since mums have notoriously shallow roots. 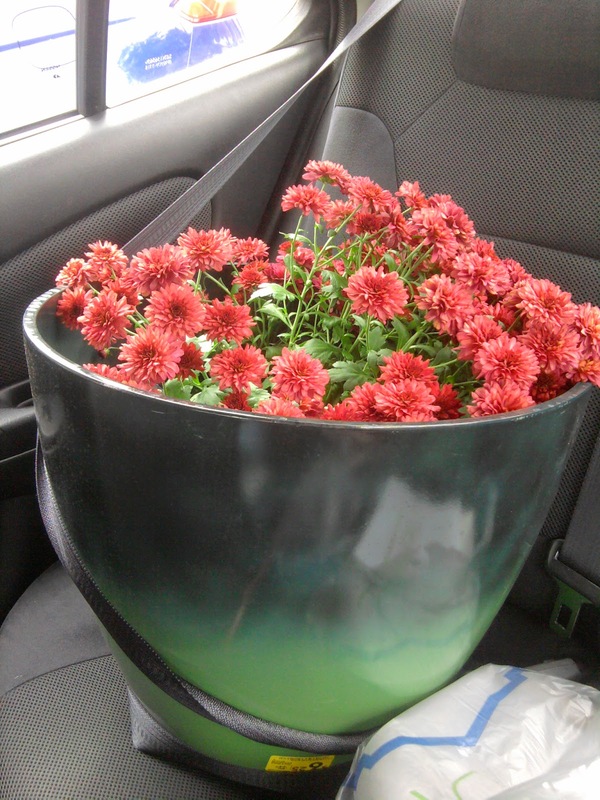 That planter was 75% off to $6.25. Another lady and I talked ourselves into buying two each because they're so pretty even though neither of us knew what we would do with them. Well, its August so ours went right into the storage shed. I don't know what she's doing with hers. A local nursery recently paired with True Value so I dropped by to see the changes. These Luna Red Hibiscuses are GORGEOUS! They're perenials and each blossom was about the size of my hand (wide open!). They were $18.99 with a 20% end of season sale so I decided to come home and research. These are only a few feet tall but I've seen these bushes taller than a one story home locally! I don't know what kind of Magic Bean fertilizer they're using because the internet says the plants are supposed to be cut down at the end of the season. Unfortunately their blooms will only last a day too. I'm still debating buying a couple. They're gorgeous but I don't know where I would plant them. I want to keep the yard as easy to mow as possible and don't want a huge bush growing right next to the garage. You did great with those pots! They are so pretty! There was a local lady advertising a plant sale on Craigslist about a month ago. 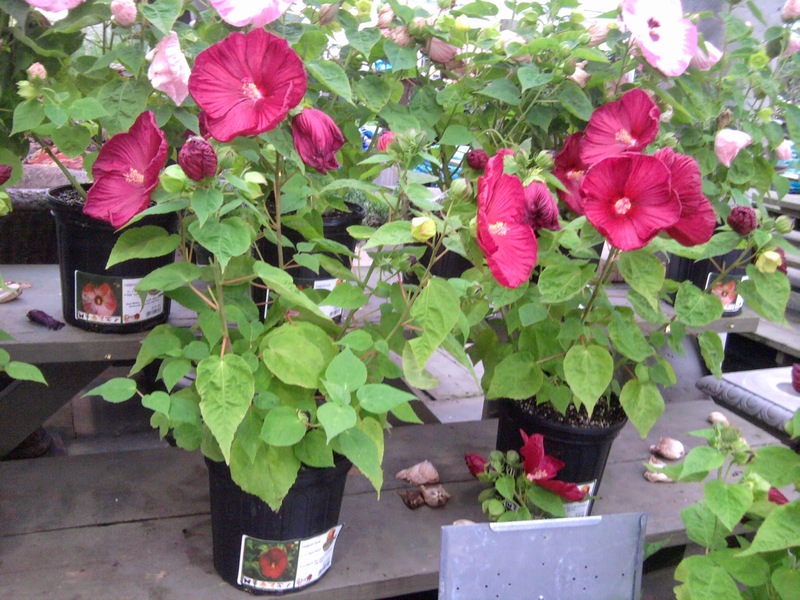 We went to check her out and I bought two of the Luna Hibiscus for $5 each! They may eventually outgrow their current location, but no biggie, we have a big yard and I'm sure I will find a place for them if/when they do! Yes ... hard to realize that Fall is almost here. Love your mums. I saw some at Home Depot the other day, and thought, wow ... too early for mums. I don't have much luck with them anyway. Thanks for stopping by Timeless Treasures with a nice comment on my junking fix every Wednesday. I look forward to that.